Many celebrate with green beer, but next week, some St. Patrick’s Day revelers will get to puff the holiday away with stogies. At an annual St. Patrick's Day gathering for the city's political and business elite, guests will be free to chomp on cigars, thanks to emergency legislation signed by D.C. Mayor Adrian M. Fenty. D.C. Council member Jack Evans pushed for an exemption to the city's smoking ban for two groups, the Society of the Friendly Sons of St. Patrick and Fight for Children, which hosts an annual boxing fundraiser in November. 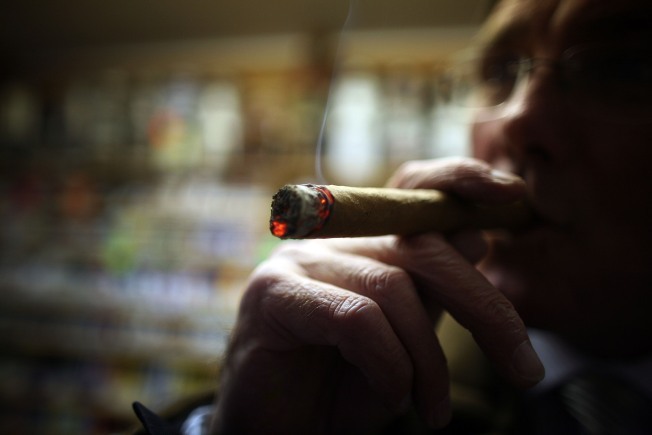 The exemption was opposed by anti-smoking groups and put the mayor in a difficult position. Fenty had championed the smoking ban as a council member, but Evans is a close ally. The Friendly Sons event draws national figures such as House Majority Leader Steny Hoyer and Supreme Court Justice Antonin Scalia. Evans, who has attended past events told the Washington Post it’s “perfectly appropriate for both organizations.” He said the emergency measure is for two nights a year and workers can opt out of working the events if they have health concerns.